Harpers Mill is located just 20 miles south of downtown Richmond and in addition to the parks, trails, shopping and amenities that you love within the community, it is surrounded by popular shopping destinations and entertainment. To find us, travel 4 miles West of the intersection of Route 288 and Hull Street Road and turn left onto Otterdale Road. Follow Otterdale Road into Harpers Mill. The Welcome Center is located at 8600 Pullman Lane, Chesterfield VA 23832. Within just a few miles of Harpers Mill, the Hull Street corridor offers convenience to retail including several grocery stores such as Publix, Kroger, and Aldi and many other options. From home stores to boutiques, you won’t have to go far to find what you are looking for. Aside from the proposed restaurant that will be located inside Harpers Mill, enjoy the convenience of being less than 5 miles away from a long list of tasty dining options or hop downtown to discover the hype of the foodie scene Richmond has to offer. 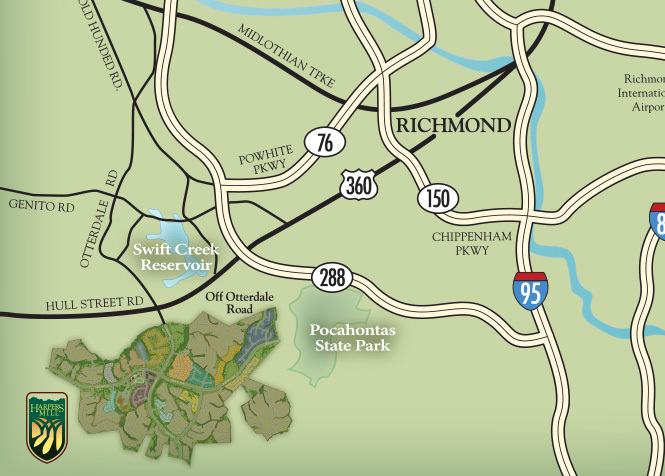 Enjoy the Richmond Zoo, golf courses, bowling and live music venues, Pocahontas State Park, Commonwealth 20 Movie Theater and more just minutes from your own oasis. Or, venture into the city of Richmond to explore it’s history, museums, breweries, restaurants and parks. Convenience when you really need it, urgent care facilities, hospitals and pediatricians are just minutes away. Arguably, one of Harpers Mills’ best features is its school district in Chesterfield County. Winterpock Elementary and Cosby High School are nationally recognized blue ribbon schools. Not only that, but Winterpock Elementary school is located right in the center of the community.